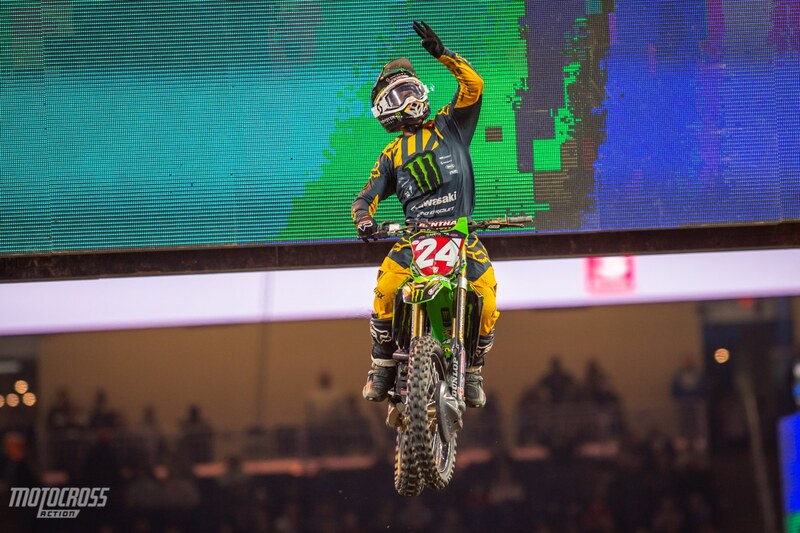 Eli Tomac rebounds after a rough weekend in Arlington to take the overall win by just one point in Detroit. 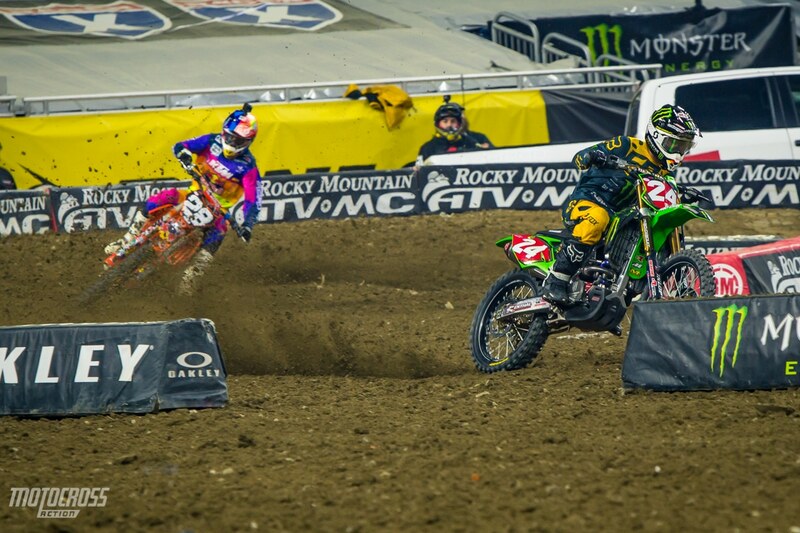 WEBB VS. TOMAC: The two stars of the night flip flopped throughout the night. 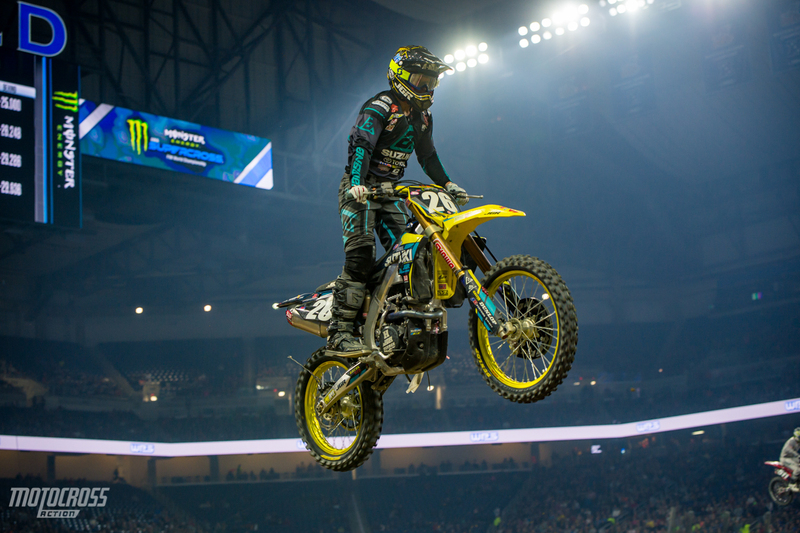 Cooper Webb started off slow in the first Main Event, he was fourth on the first lap and dropped back two positions to finish sixth. 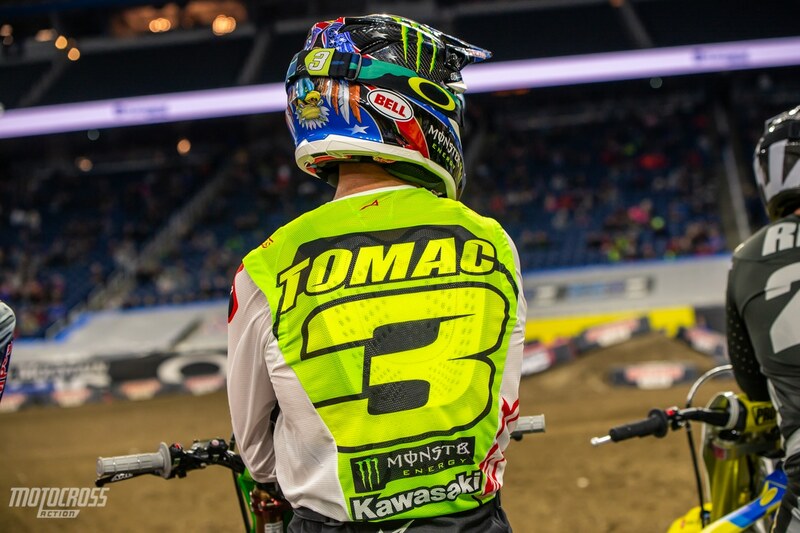 Tomac did almost the opposite, he started in eleventh on the first lap and passed all the way through the pack to take the win. In the second moto, Webb got the holeshot while Tomac started in third. Eli made the pass on Cooper on lap five and they finished one and two. The third moto was a different story, Eli had some struggles. Early in the race he was back in twelfth, but he put his head down and made his way to sixth. Cooper Webb started in fifth and made his way to the front and won the final race of the night by just a few feet over Blake Baggett. Tomac’s 1-1-6 scores were good enough to win the overall by one point ahead of Cooper Webb who went 6-2-1. 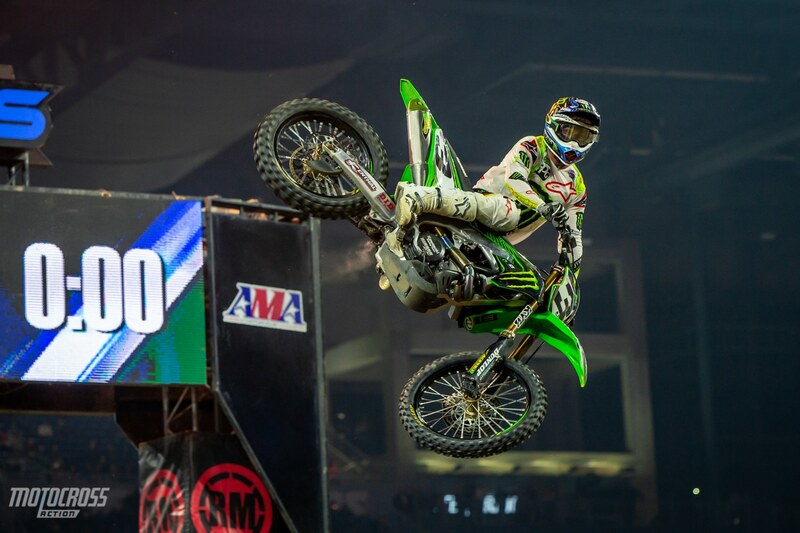 Notice the big censored logos on Chad Reed’s visor? 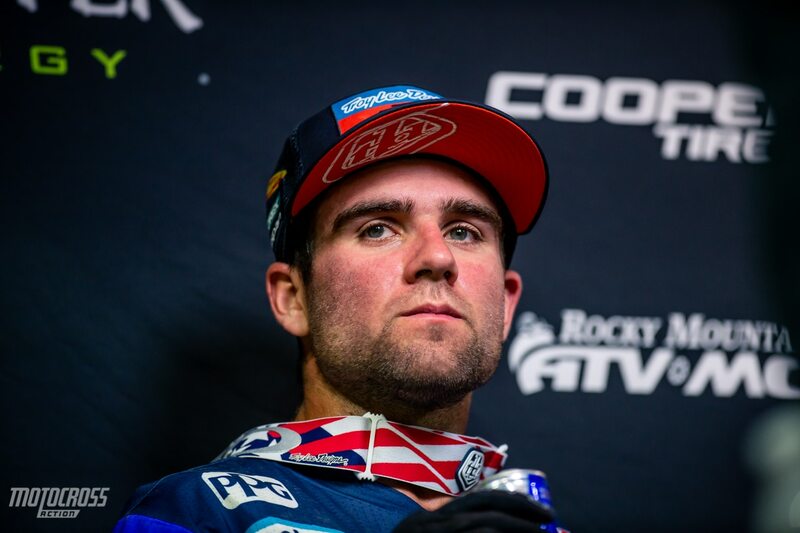 Chad has been stirring the pot with the AMA and Feld by running “censored” logos on his visor and by ‘kind of’ thanking his CBD sponsor on the podium. During his TV interview with NBC Sports he said: “It feels so rad to be up here and I’m honored to ride this JGR Suzuki. Man , I just want to thank everybody that’s had my back. Everybody at Fox and Scott, and go check out @crtwotwo on my Instagram and figure out what this is about. Because I’m not allowed to thank them, and I love people that support the sport, so thank you…” (as he holds up his helmet with the word ‘censored’ across his visor three times.) The AMA banned the promotion of CBD products last week, right after Chad Reed gained CBD MD as his new sponsor. Click here for more info on the CBD ban. 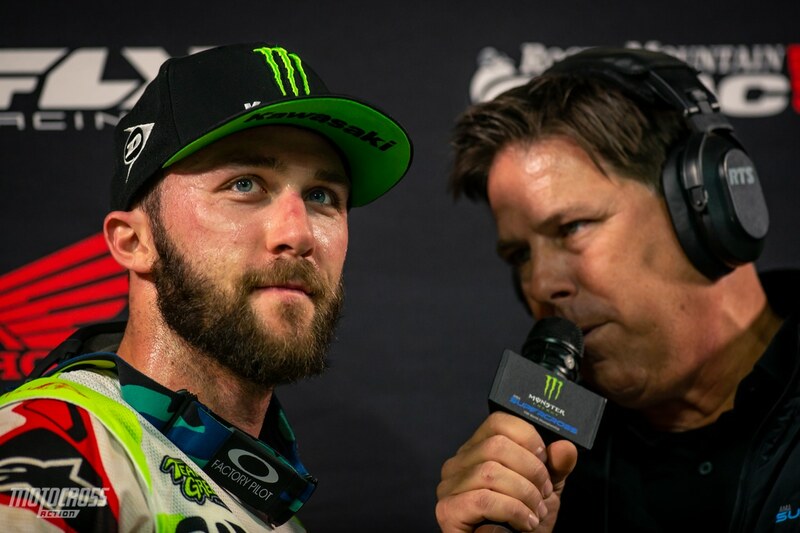 How are you going to beat Austin Forkner? Chase Sexton: “The biggest thing is starts, he’s been pretty lights out with starts. Just getting out front and just riding your own laps. Being in the top five is not good enough. You gotta get the holeshot and put in your good laps. I felt good on the bike today, I thought this was going to be the night I could challenge and hopefully get the win. But it didn’t come yet, I just gotta get those starts good, but yeah he’s (Austin) been crushing it. But I feel good and we’re getting better every weekend. So just gotta work on those starts this week and come out swinging next weekend for the East/West shootout. 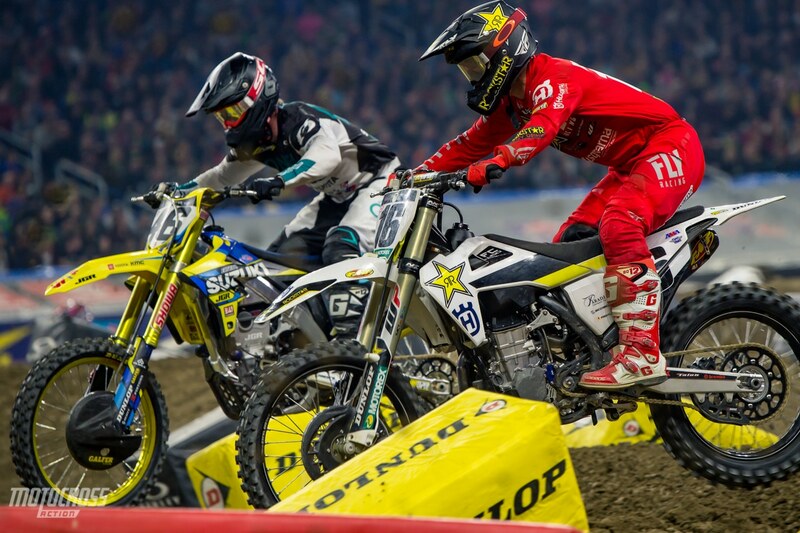 Chad Reed and Justin Brayton were very impressive in Detroit. Chad was up front on the start of the first Main Event but it was Justin Brayton who grabbed the early lead and stayed out front for ten laps. Chad ran second for most of the race until Eli Tomac came and passed both of them. With three twelve minute-plus one-lap motos in the Triple Crown format, there’s more opportunity for guys like Brayton and Reed. They have three starts, which means three chances to get up front early, and the races are shorter. 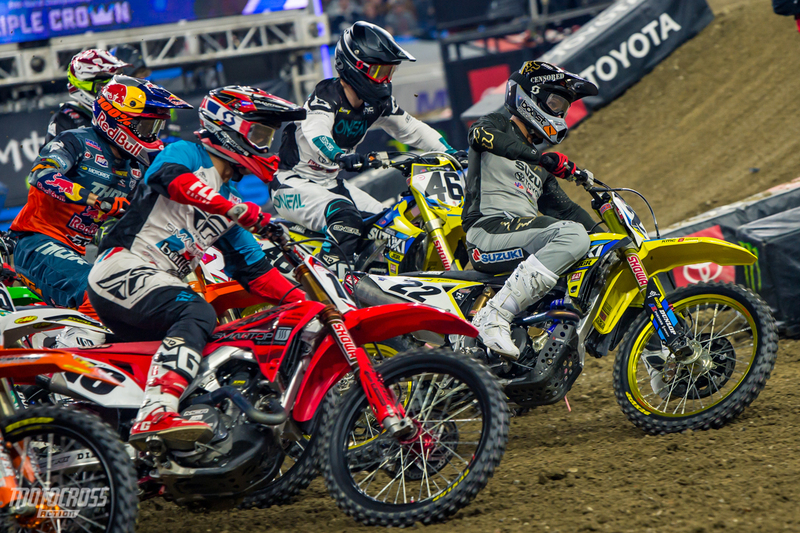 Naturally shorter races makes the guys who usually don’t win, more confident knowing that if they get a holeshot, they won’t have to hold the pack off for the full duration of a standard twenty-minute plus one lap Main Event. 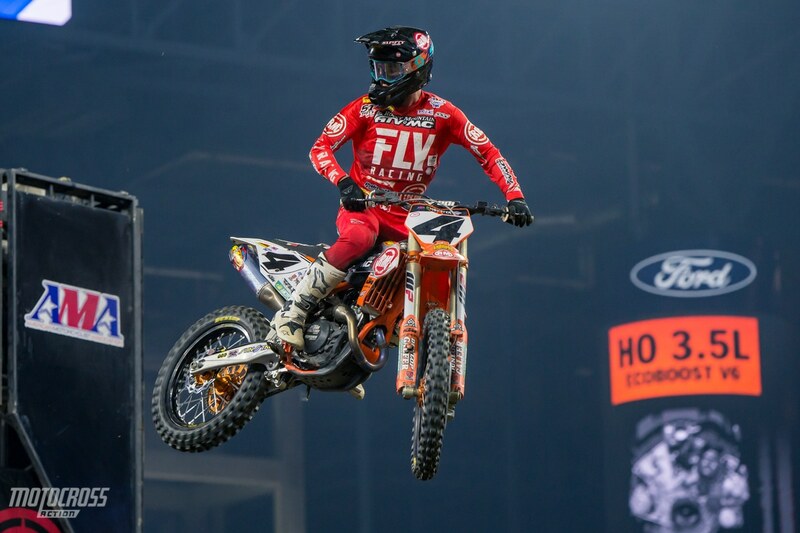 Blake Baggett went 4-11-2 to finish 5th overall in Detroit. His results were up and down throughout the night, but he turned on the after burners in the last moto. He led the first six laps and then after getting passed by Barcia and Webb, he rebounded and passed Justin back and then almost passed Webb in the final corner of the race. 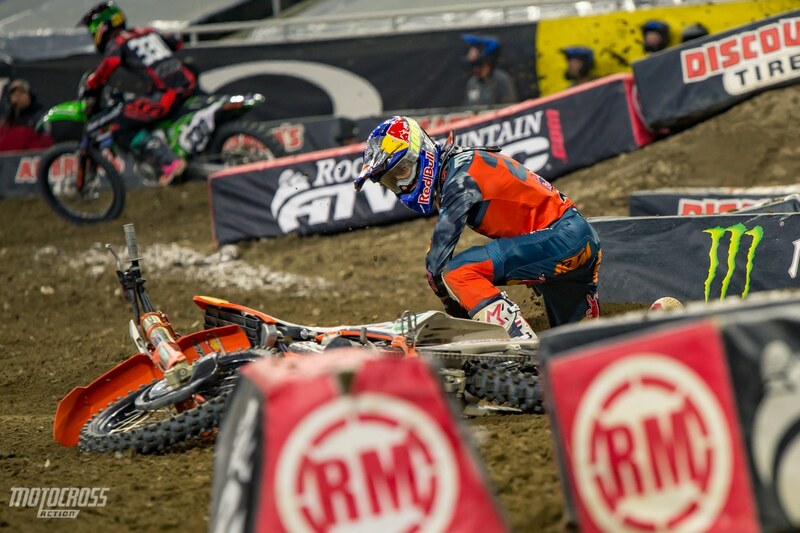 Round eight did not go as Marvin Musquin would’ve liked. He went 9-4-4 for 6th overall. In the first race of the night Joey Savatgy battled passed the Frenchman and eventually took him out on accident. Coming out of a slick corner, Joey’s rear end swapped him right into Musquin’s line. Having nowhere to go, Marvin ran right into him and went down. After Detroit, Red Bull KTM’s Marvin Musquin is third in the450 Championship, twelve points behind his teammate. 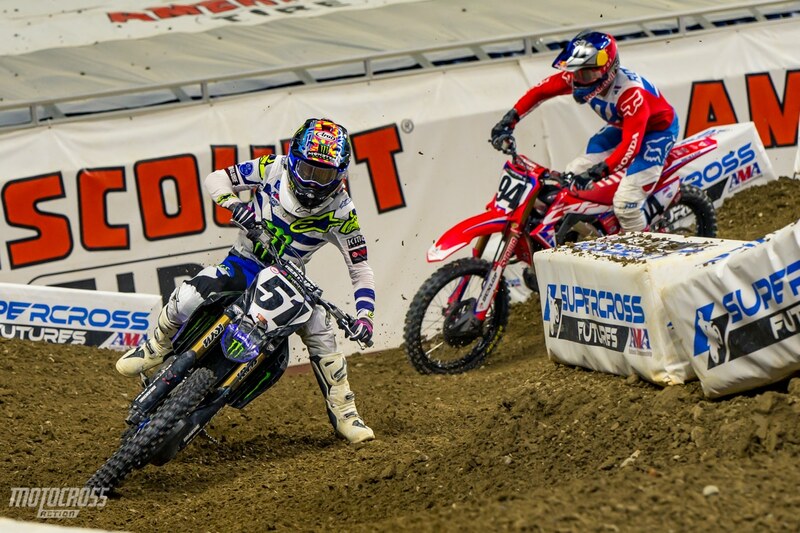 Two of the 450 rookies battle in Michigan. Zach Osborne went 11-8-10 for 10th overall while Justin Hill went 13-14-12 for 13th overall. 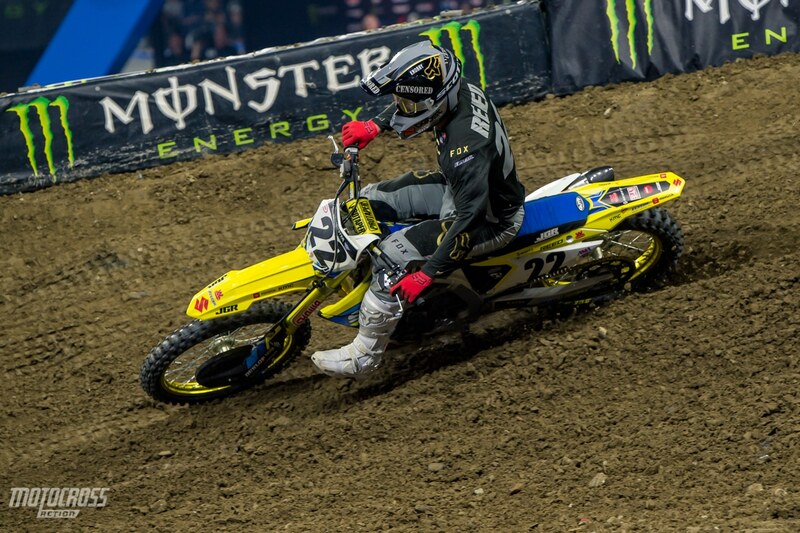 After being taken out by Tyler Bowers in Arlington, Justin Barcia was riding aggressive as usual. 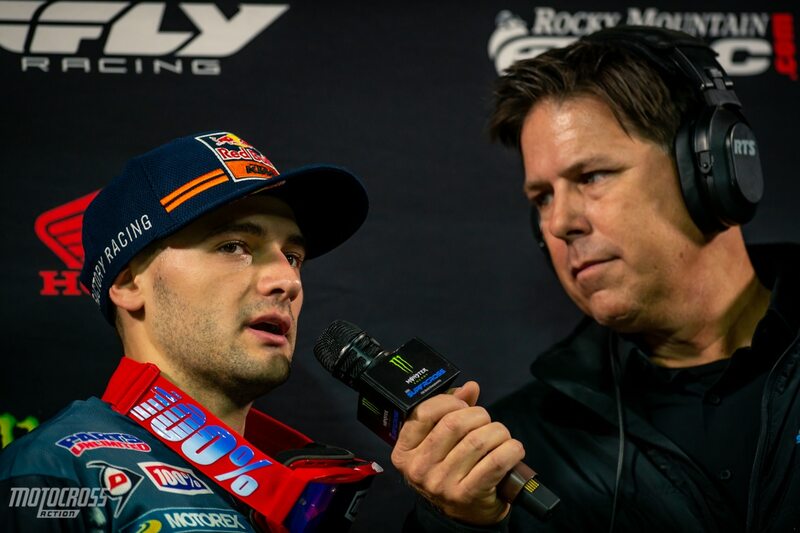 He scored a 10th and 7th in the first two motos and then after taking Dean Wilson out and battling with Webb and Baggett he finished 3rd in the final moto which gave him 7th overall on the night. 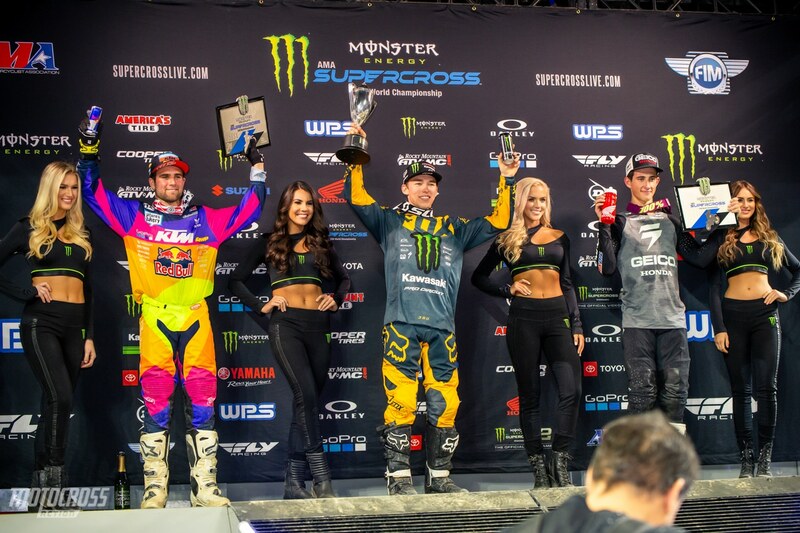 Detroit was almost going to be considered an “off day” for Cooper Webb, he qualified ninth and in the first moto he dropped back a few positions to finish sixth. Cooper and the KTM team made some changes and he was able to turn it around in the final two motos. 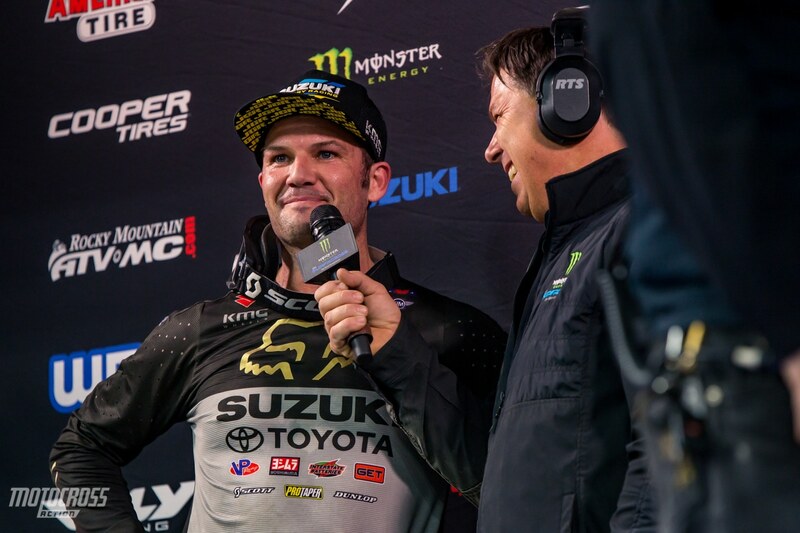 A second place behind Tomac in the second moto and a win in the final moto gave Cooper Webb a 6-2-1 score and second place overall in Detroit. He was only one point away from turning his “off day” into an overall win on the night. It certainly was impressive to see him rebound after a slow start. Cooper will keep the red plate and the points lead going into Atlanta. 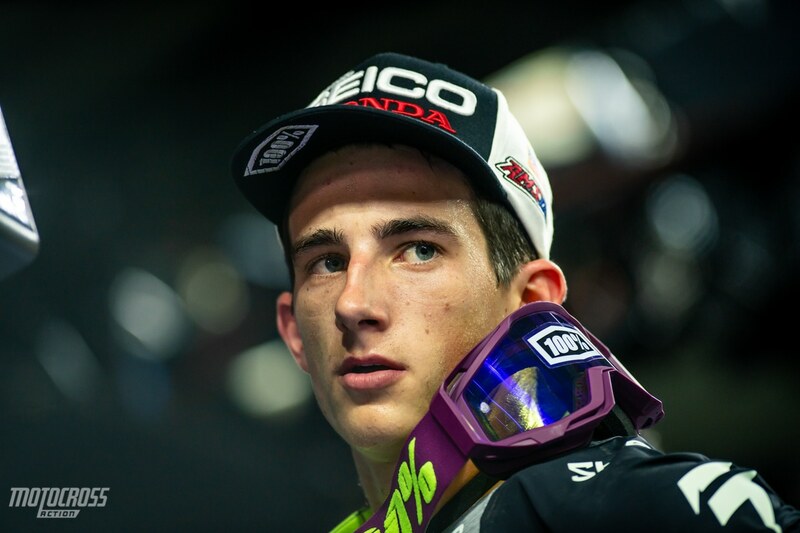 He has a six-point lead over Ken Roczen and a thirteen point gap on Tomac. 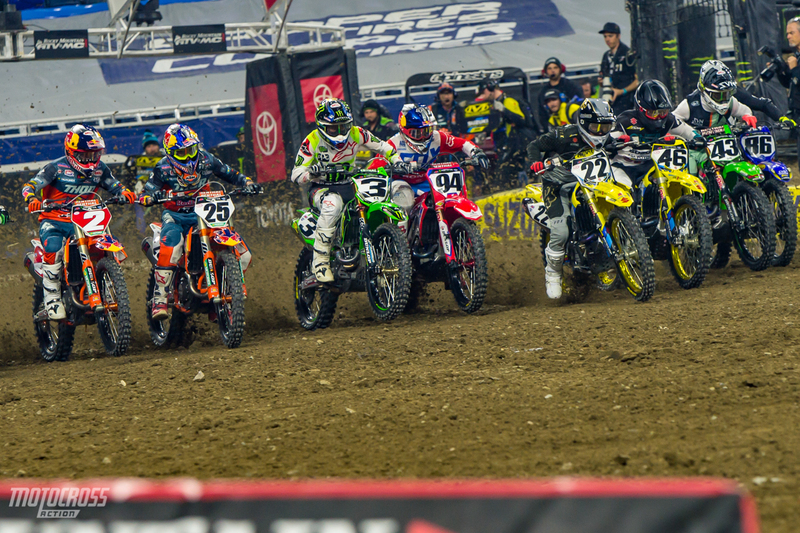 Even when Chase Sexton (#23) started right next to Austin Forkner (#24), he wasn’t able to pressure the points leader. Austin has been so good at getting into the lead and sprinting early on in the races, nobody has been able to touch him yet. So far this year Forkner has made mistakes and has had some big crashes in practice and qualifying. Luckily for Austin, he’s been able to stay healthy and smooth out his riding for the races. When asked about the difference in his riding from qualifying to night show, Forkner said that he tries to find the limit during the day, and that way he knows how hard he can push when it counts. In the races he manages his speed and the amount of risk he has to take. 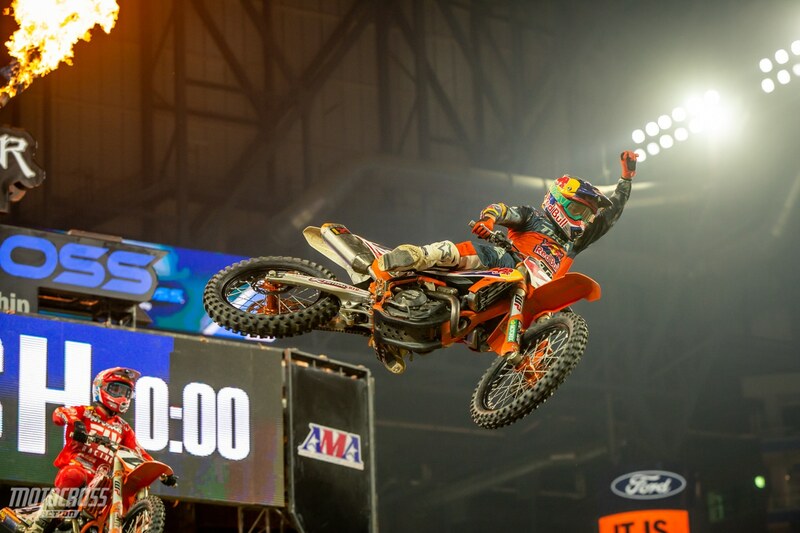 While running second place in Arlington, Jordon Smith crashed in the whoops and hurt his wrist. Luckily, the doctors only diagnosed it as a bone bruise, but it’s still bothering him quite a bit. During the week he was only able to ride one ten-minute moto because his wrist was bothering him so much. 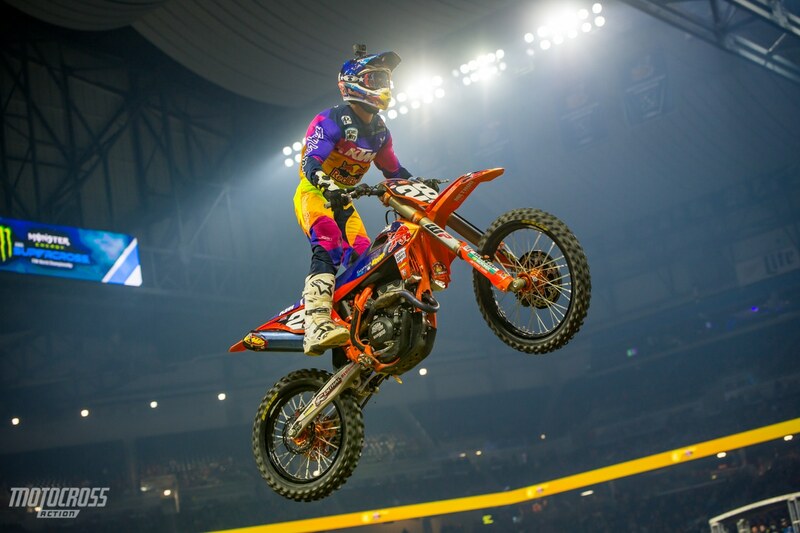 In Detroit, the Troy Lee Designs Red Bull KTM team decided to soften the initial feel of his suspension to hopefully help his wrist. Even with the injury he still rode well, a 2-2-4 he score put Smith on the podium with a 2nd overall. Alex Martin was fast, he qualified third just 0.4 behind Chase Sexton. His results were up and down in the three Main Events, a 10-3-6 gave Alex 6th overall. 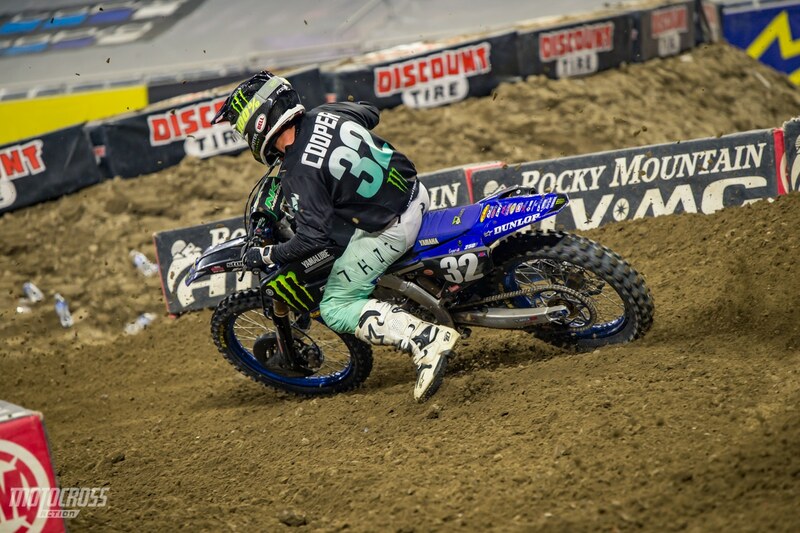 Justin Cooper had another solid night of racing. For his fourth Supercross race ever, Cooper is riding with the confidence of a veteran. He made a pass on Jordon Smith that was a pure power move, he slammed the door and actually hit his rear wheel on Smith’s front wheel in the third moto. Smith was lucky to not go down. 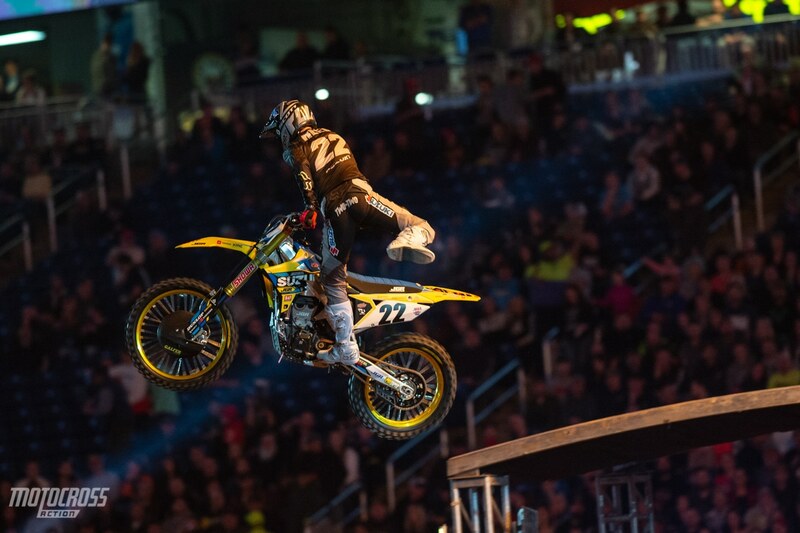 Justin Cooper went 3-5-3 in the motos which earned him a 4th overall in Detroit. 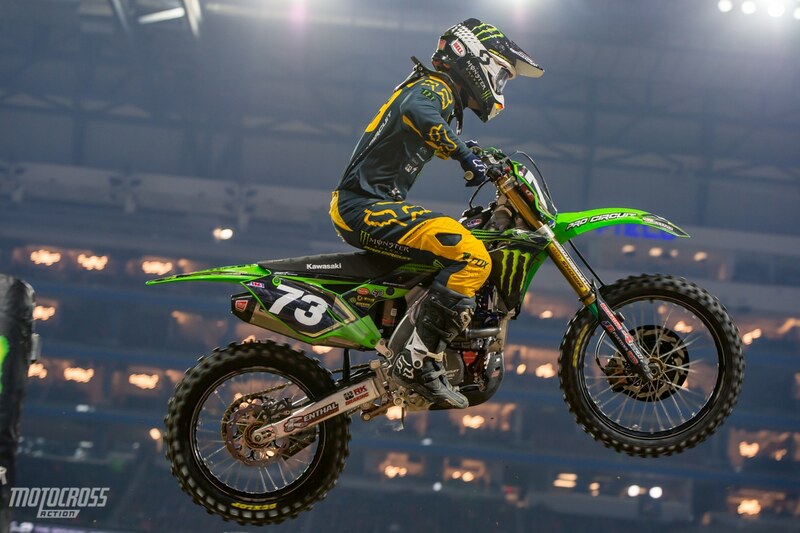 He now sits third in the Championship, fifteen points behind Austin Forkner. 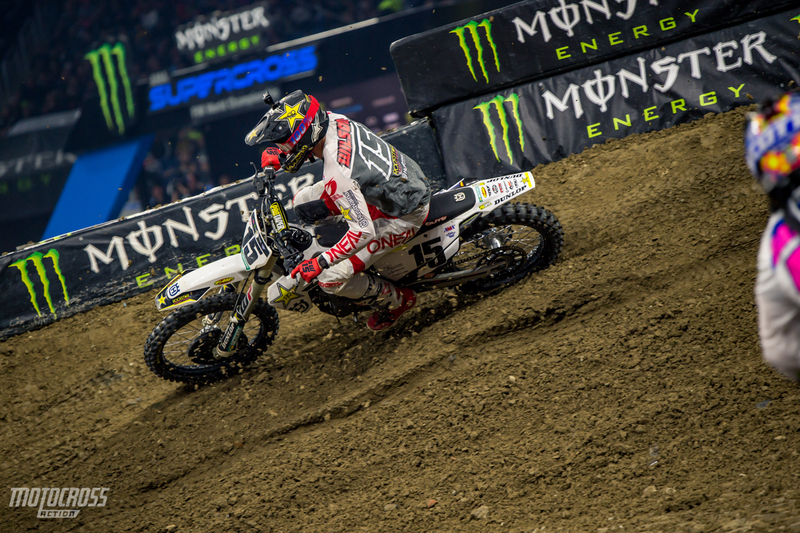 The 32 year old from Ecuador, Martin Davalos was consistent with 5-7-5 scores to give him 5th overall. 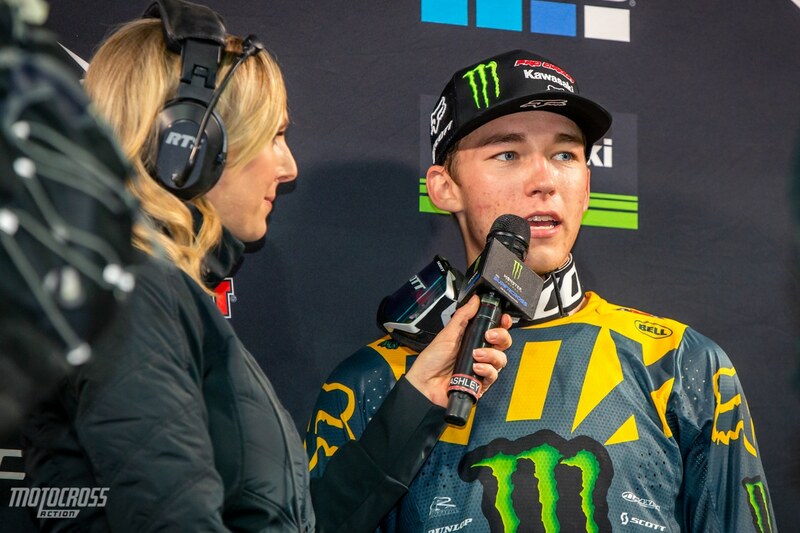 Austin Forkner, Jordon Smith and Chase Sexton made up the 250 East podium in Michigan. 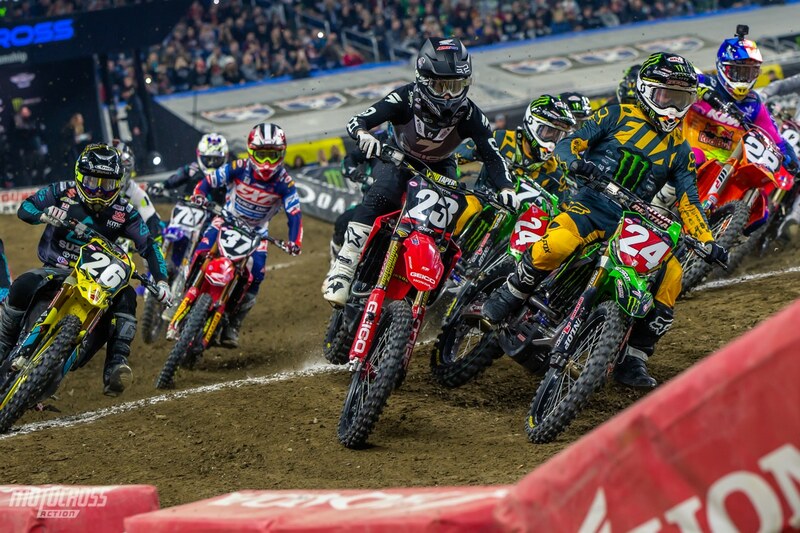 We are excited to see the 250 East division line up against the best from the 250 West this Saturday at round nine of the 2019 Monster Energy Supercross season in Atlanta. Thanks for reading, Motocross Action’s The Aftermath!